I was reading through some posts on Bon Appetit a few weeks ago and came across one of their posts that talked about the key skills that their interns have to show before getting hired. One of those skills was roasting a chicken. Could you pass a cooking test with your roasting skills? Honestly, I've never oven roasted a whole chicken before. Lots of turkeys, and I've done rotisserie chicken on the grill but never in the oven. Well, I wasn't going to fail some test if someone from Bon Appetit ever showed up on my door step so I thought I better get moving. One of our favorite date nights is to go volunteer at Kitchen In The Market, a local commercial kitchen and cooking school. When I was thinking of ideas to submit for a Foodbuzz 24x24 event, I immediately thought of taking a spin on one of their most popular cooking classes; Cooking the Market. The idea behind the class is to create a meal based on whatever is currently available in the market, no matter what season it is. 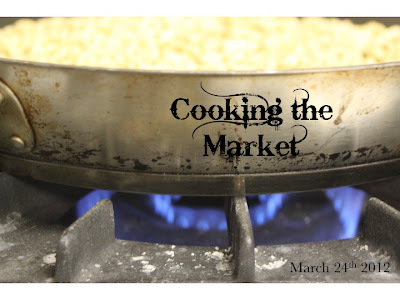 It's a fantastic class that always produces something different and fun to cook. It has been a beautiful, early spring here for us Minnesotans but we're still not into the full on farmers markets quite yet. That doesn't mean that there's no local product available however. One of my goals in sharing this event with some of our friends was to show them the amazing products we have available right here in our local area, all year round as well as get them excited about the great food season to come! Every year around this time, the weather starts warming up and Maple trees start to release their sap. When I lived in Montreal I loved this time of year when sugar shacks would start popping up all around the countryside. These little shacks would create wonderful meals centered around the wonderful maple syrup. 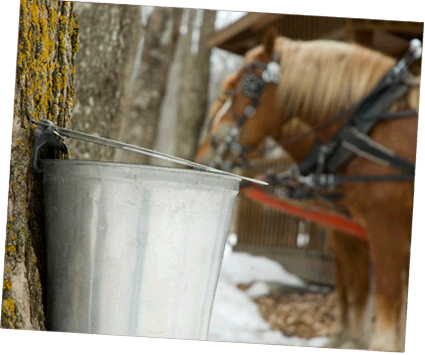 Every dish had some kind of maple product in it and we even drank maple water; the pure sap straight from the tree. I'm so excited to announce my participation in the Nuts About Oats Contest sponsored by Peanut Butter & Co. and Bob's Red Mill! I was one of six bloggers asked to create a breakfast recipe using peanut butter and oats. It took me about 2.5 seconds to figure out what I wanted to make. I grew up with my my Mom making these amazing cranberry cream scones and I knew I could easily integrate some peanut butter and oats into them and make them even better. It's buffalo week with Virtual Potluck! Ever cooked with buffalo meat or sausage? If you haven't you're going to have lots of recipes to try out now. Visit our host blog to see join in the potluck! This buffalo came to us directly from The Buffalo Guys. The thing I liked most about the buffalo meat is that it's lower in cholesterol and fat than other comparable meats. These buffalo are happy guys out roaming free on the range and no fillers or other nasty stuff to get in the way. The flavor is great and we used all of them in a variety of ways. Hot dogs went into some Mac and Cheese for the kids, Andouille sausage went into a Jambalaya and the Polish Sausage went in to the dish I'll share with you below.